Hoffer Flow Controls, Inc. recently received a new contract to supply 575 fuel flow meters as a part of the U.S. Navy’s H-53 heavy lift helicopter fleet upgrade. The most powerful helicopter in the U.S. Military, H-53 helicopters perform many tasks within the U.S. Military including heavy lifting, transport of supplies, combat search, rescue missions and mine sweeping to clear vital shipping lanes. The current H-53 helicopter fleet is slated to remain in service until mid-to-late 2020’s.Hoffer fuel measuring flow meters will be paired with Howell Instruments’ fuel flow indicators to comprise an upgraded fuel flow indicating system for the helicopters. Howell Instruments developed a custom indicator that requires no rewiring and provides a fit, form, and function replacement to monitor the fuel flow.Hoffer’s 1/2”x3/8” custom liquid flow meters with temperature compensation have special magnetic pickup coils for pairing with the Howell indicators. Made with custom designed housings that will fit within the footprint of the existing space, the female MS ¾” end fittings mate with the existing aircraft interface connectors and fuel lines. The Hoffer 316 stainless steel flow meters provide a repeatability of +/-0.1% of reading and temperature compensation. Installation of the fuel flow measuring systems is expected to begin in February of 2016. 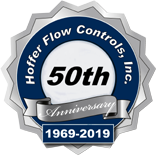 Hoffer Flow Controls has a long history of providing high quality, highly accurate turbine flow meter systems to the Navy and other area’s of the U.S. defense and aerospace industries.